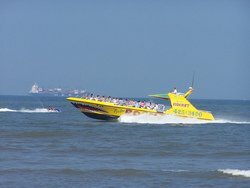 Rudee Inlet - Virginia Beach's Center for Water Fun! It's true-- Rudee Inlet is THE center for water fun (other than just catching rays and waves) at Virginia Beach. Jet skis, parasailing, dolphin and whale watching...it's here. Take a ride on the Rudee Rocket! Photo copyright 2013-2015 by Eileen Mundok. Jet skis are only one of the things you can rent here to cruise the inlet: rent Wave Ventures, sports boats, jet boats, and kayaks too. It's next to Big Sam's Restaurant and Raw Bar on the Inlet. They also offer full and half day sport fishing charters. Hours and Fees: Call for details and be sure to look for coupons in the local visitors guides (see below for a link). Rudee's Jet Ski Rentals address: 300 Winston Salem Ave, Virginia Beach VA. Phone number: 757-428-4614. Another option for parasailing (see Adventure Parasail above). Check their website for coupons for romantic sunset parasailing deals. They also specialize in wedding proposals and group flights! Hours: Open 8 am; call for detailed hours and up to date prices. Look for coupons in the local visitors guides. Rudee Tours offers six different adventures on the water: whale watching on the Rudee Whaler (Dec-March only), dolphin watching on the Rudee Flipper, hour-long high speed tours on the Rudee Rocket, more casual day cruises on the Rudee Explorer, sunset cruises and deep sea fishing. Rudee Rocket- $20 per adult, $15 kids 39 inches to age 11. Rudee Explorer- $5 per person/$3.50 for members of Virginia Aquarium. Kids 2 and under are free. Rudee Flipper- $18 per adult/$14 per child 4-11. Kids 3 and under free. Rudee Whaler- Call in November for 2008-2009 prices. Rudee Sunset Cruises- $18 per adult/$14 per child 4-11. Kids 3 and under free. Rudee Deep Sea Fishing- call 757-422-5700 for prices and schedules. *Be sure to look for coupons in the local visitors guides. Rudee Tours address: 200 Winston Salem Ave, Virginia Beach VA. Phone number: 757-425-3400. Click here for a Google Rudee Tours map. Rudee Inlet is home to one of our very favorite seafood restaurants: Rockafeller's. Shrimp, lobster, crab cakes, oysters, she crab soup...you name the seafood, they've got it at Rockafeller's. Do NOT miss their Buffalo Style Shrimp, served with homemade bleu cheese dipping sauce, or their Jumbo Lump Crab Cake Dinner (no fillers, all crab!). Tip! Want to enjoy great seafood for less? Check out the Sunny Day Guide. This website and coupon book (which can be found along the Virginia Beach Boardwalk area as well as at many Virginia Beach restaurants and attractions) sometimes has coupons for local restaurants like Rockafeller's. And for more things to do in the Virginia Beach area, go to my Virginia Beach Guide.